Selina created the Georgina Barnes identity in Not My Kink to go undercover in the financial world. 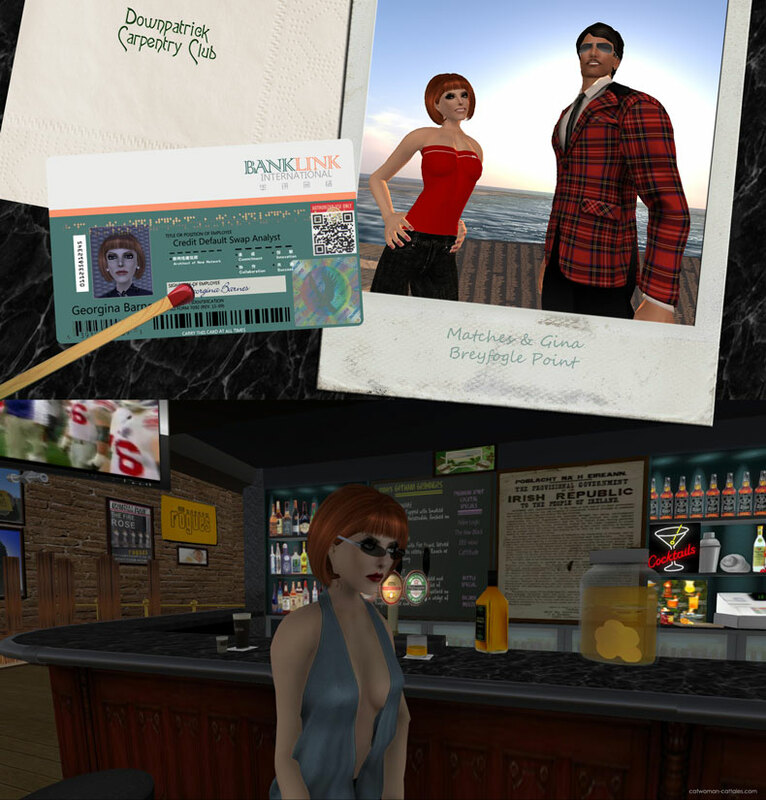 She reappeared for the Wall Street portion of the con in Electron 29, but then Bruce turned everything on its head in The Gotham Rogues, claiming her for Matches Malone when he reinvented the cover as Gina O’Malley, a grifter who only posed as Georgina to infiltrate places like CashPulse and BankLink. Beneath Batman’s disapproving scowl, the part of Bruce’s mind that would later play Matches grinned in reply. He hadn’t decided yet why Matches was looking for Gina: if she had double-crossed him, cheated him, or just up and disappeared when the wrong people started asking questions about something she was involved in that he had no knowledge of. The reason didn’t matter, since it was a given that whatever Matches told the Westies was sure to be a lie. Bruce decided now—or actually, Matches decided as he watched Selina put on the wig and fuss with the red locks with that naughty-girl grin—that whatever the Gina-Matches history was, she’d broken his heart. He went searching for her at the Downpatrick Carpentry Club to infiltrate the Westies, thinking to just show her picture, but before long, the lady herself appeared, playing up to Falcone underboss Anthony Marcuso.